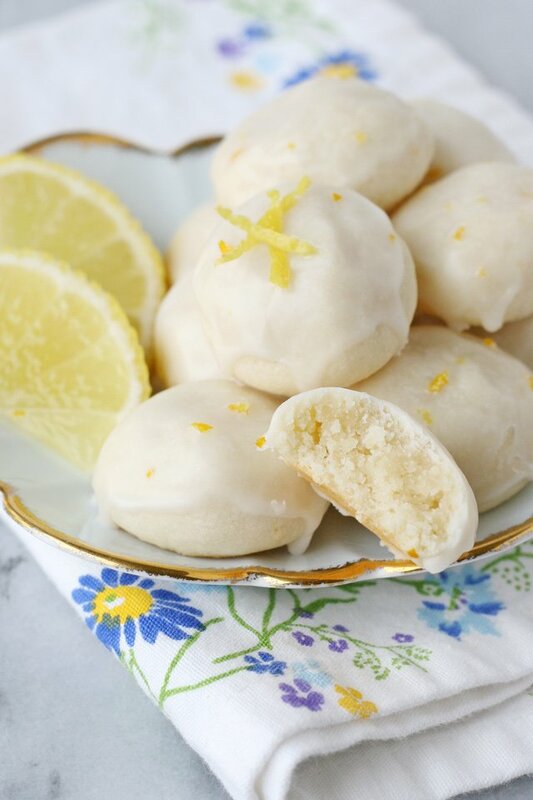 These cute little Lemon High Tea Cookies are buttery, packed with lemon flavor and melt-in-your-mouth delicious! 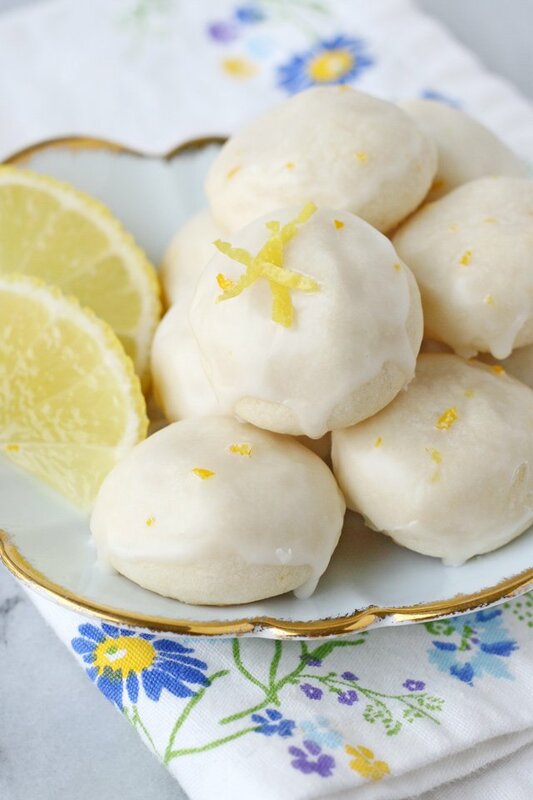 I’ve seen variations of this recipe called Lemon Meltaways, or Snowballs, so you may have enjoyed a version of this cookie before! I first enjoyed a version of this recipe years ago and they were called High Tea Cookies, so I stuck with that. Also, the delicate texture of these cookies lends itself so perfectly to be enjoyed with tea, so I think the title is just right. I was inspired to share this recipe after my recent Mexican Riviera Cruise with Princess Cruises. One of my favorite daily treats on Princess Cruises is their afternoon tea. What a luxury it is to enjoy cute little sandwiches, treats and tea in the middle of the afternoon! So while I’m home dreaming of my next cruise, I can enjoy these little tea party treats anytime! 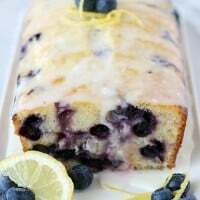 Buttery, packed with lemon flavor, and melt-in-your-mouth delicious! In a small bowl, whisk together the flour, corn starch and salt, then set aside. In the bowl of an electric mixer, beat butter until smooth. Add powdered sugar, and beat until fully incorporated. Add lemon zest, then, while mixing, slowly add lemon juice. While mixing (on low), slowly add flour mixture and blend until all of the flour is fully incorporated. Stop mixing and scrape down the sides of the bowl, then cover and refrigerate dough 30 minutes to 1 hour. When the dough has chilled, use a 1 tablespoon sized scoop to scoop out dough, then roll dough into balls and place on a parchment paper lined, or Silpat lined baking sheet. Press down on the dough balls just a bit to flatten the tops. Place entire baking sheet (with cookie balls) in the fridge or freezer while the oven heats up. Bake in preheated oven at 350°F. for 11-13 minutes, or just until the edges of the cookies are golden brown. Cool just a bit on the baking sheet, then move cookies to a wire cooling rack. When cookies have been baked and cooled, make glaze. 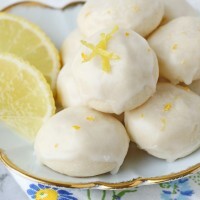 To make glaze, simply whisk together powdered sugar, lemon zest and 2 tablespoons lemon juice. Add a bit more lemon juice as needed to reach desired consistency. Dip cooled cookies into glaze, then return to wire cooling rack (with a baking sheet below to catch excess glaze) and allow glaze to set up before storing cookies. This is a recipe that really requires fresh lemons for the best results. Feel free to substitute with juice and zest from Meyer lemons. I would not suggest substituting bottled lemon juice or dried zest. Do not chill dough more than 1 hour before rolling into balls or the dough will be too firm to work with. If you do not have a 1 tablespoon sized cookie scoop, use a 2 tablespoon sized scoop, then cut that dough in half before hand rolling into balls. 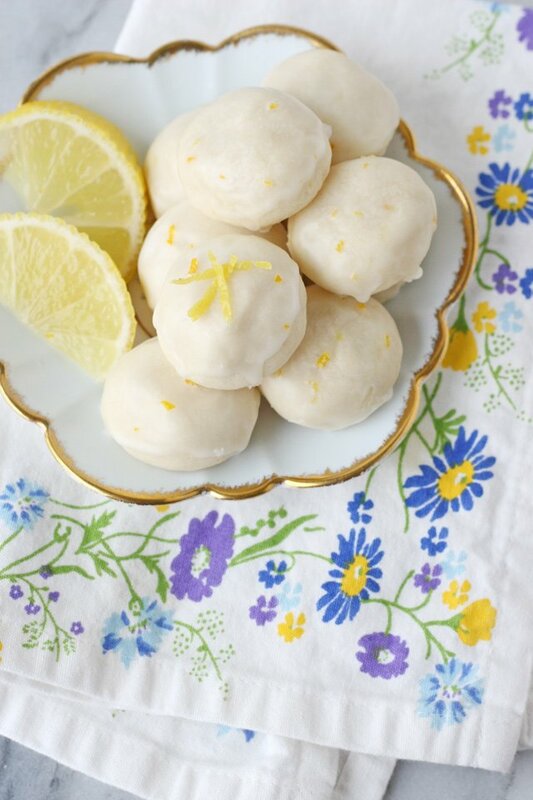 I was just thinking it was about time for some lemony treats! ! ! These look like they should fit the bill perfectly! 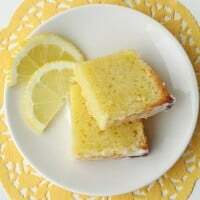 I LOVE lemon! It isn’t safe for me to have have them in the house. It would mean I would eat them all. 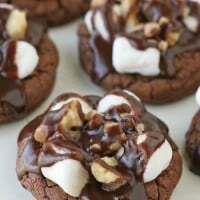 )-: These look yummy!! Afternoon tea is served about 4:00 in the afternoon with tea, finger sandwiches, scones with clotted cream and jam, and yummy little desserts like these cookies. High tea is served in the evening with steak and kidney pie, bangers and mash, casseroles, and beer, much like pub food. 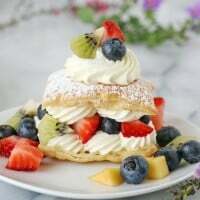 High tea sounds more elegant, but afternoon tea is what you want if you’re serving these little lovelies. I made these today, very nice! Oooh! You have been posting a lot! I’m catching up, ha! If it weren’t Girl Scout cookies season I would definitely be making these today! Yum! Can these be made ahead and for how long can they be stored? beautiful cookies and an even more beautiful towel with the little flowers, may I pleease know where it is from? I’m also curious how long these cookies can be stored before the tea? Hi I was wondering if you could put the cookies in the fridge for a bit longer time? Like overnight and cook them the next day? Let me know. I’ve never tried to keep the dough that long (before baking). I’m not sure I’d recommend it because of the high butter content I think the dough balls would get quite hard and then might not bake quite right… but it’s worth experimenting if you have the time. What kind of flour did you use, all-purpose, self-rising or cake flour. It would be really helpful if you would specify this. Thanks. Hi Margie, In the U.S. any recipe that calls for “flour” refers to “all purpose flour”. If the recipe requires anything different it will be listed. Happy baking!